2x 3.7V rechargeable batteries with on-off switch & charger. Around 5 hours heat per battery in continuous use. Heats 4 fingers and top of hand (not thumbs). Batteries can be charged in car using accessory (purchase separately from our ACCESSORIES section). 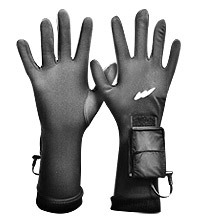 Gloveliners must be worn with windproof/waterproof gloves to trap the heat. 35-45c for around 5 hours. 1 pair of Gloveliners.2 rechargeable batteries with charger (plus travel adaptor if required). This cable extension permits a battery to be resituated in a shirt pocket or elsewhere- available from our ACCESSORIES Section. One-Size-Only. Note: Small and Medium hands will be fine for this product, probably large too. Larger hands, especially XL or XXL may prove too big despite the fabric's elasticity.